Mom’s Classic Banana Bread is dense but moist and bursting with bananas and crunchy walnuts. It’s simple to make with common ingredients you already have in your pantry. Don’t toss out those spotty bananas, get baking! Is there a certain food that just reminds you of home? Or childhood? Or a special event in your life? For me, banana bread always makes me think of my childhood. I grew up with two active parents in the kitchen and we ate a variety of foods but whenever I conjure up the foods I remember most, banana bread always tops the list (with no bake cookies and lasagna on its heels). Most often, cutting a slice, slathering it with butter and nuking it for 30 seconds to warm it up. In my mind that is the only way to eat banana bread. Or fresh out of the oven slathered in butter. That’s even better. So if you haven’t figured it out by now, Mom’s Classic Banana Bread is the banana bread I grew up eating. It’s the perfect simple and classic banana bread packed full of warm spices and toasted walnuts. 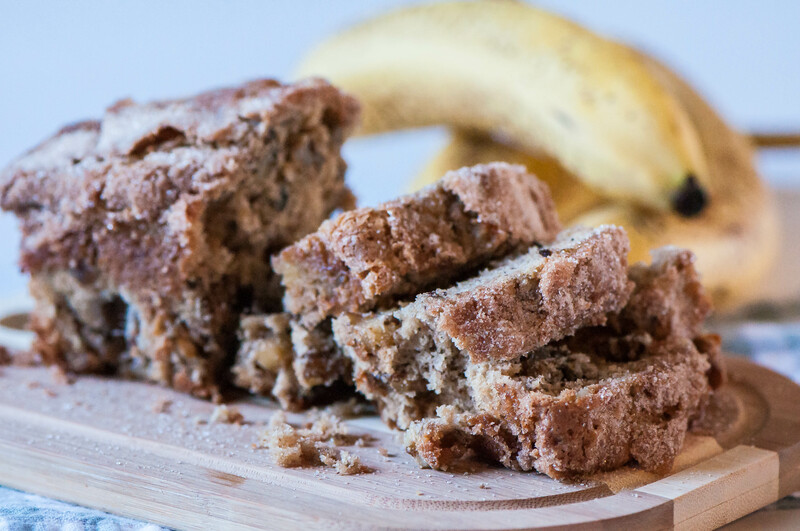 I added a sprinkling of cinnamon sugar on top to create a crusty, sparkling sweet top that I love so much but besides that little change, this is the banana bread of my childhood. This banana bread is dense and heavy but still moist. It’s bursting with banana flavor from 2 super ripe bananas and is filled with warm spices. I love to toss in a few handfuls of chopped walnuts for texture, crunch and flavor. As always, if nuts in your baked goods aren’t your thing you’re weird, I mean leave them out. Or if some like them and some don’t like at my house make mini loaves (that’s what I did today) or just sprinkle them on half the loaf before baking rather than mixing them in. I prefer them mixed in but that’s a better option than not at all. It seems like many quick breads often yield two loaves which is nice if you are taking it somewhere or sharing with a friend or neighbor but otherwise, that second loaf often goes uneaten before it gets stale. Or I eat a whole loaf myself. Neither option is good. Of course you could freeze the second but I never think of that in time. This recipe is for one loaf, making me love it even more. So if you are looking for a classic, never let you down loaf of banana bread this is totally the one for you. Preheat oven to 350 degrees F. In a stand mixer, cream together the butter and sugar until light and fluffy. Add eggs, one at a time, until incorporated. Add vanilla. In a mixing bowl, combine flour, baking powder, baking soda, salt, cinnamon, allspice, cloves and nutmeg. Alternate adding dry ingredients and mashed bananas, starting and ending with dry ingredients. Mix until just incorporated. Stir in nuts. Grease 3 mini loaf pans or 1 standard loaf pan generously with nonstick spray. Fill loaf pans two-thirds full and place on a baking sheet (in case they overflow this will save you from a huge mess in the bottom of your oven). In a small bowl, combine the granulated sugar and cinnamon. Sprinkle evenly over the loaves. Bake mini loaves for 30 to 40 minutes, or until a toothpick comes out clean with moist crumbs. Bake a regular loaf for 50 to 60 minutes.